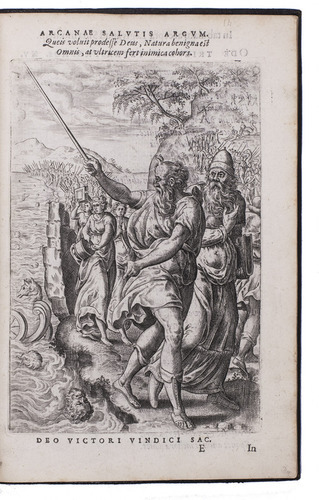 ARIAS MONTANO (MONTANUS), Benito (Benedictus). 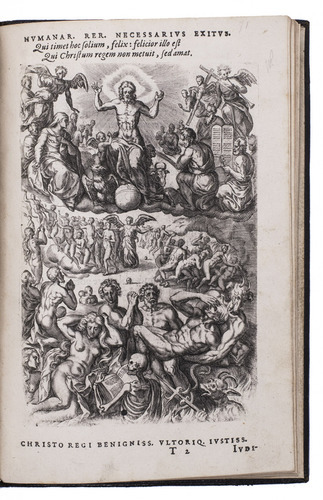 Antwerp, Christopher Plantin, “1571” [= 1582/83]. 4to (22 x 14.5 cm). 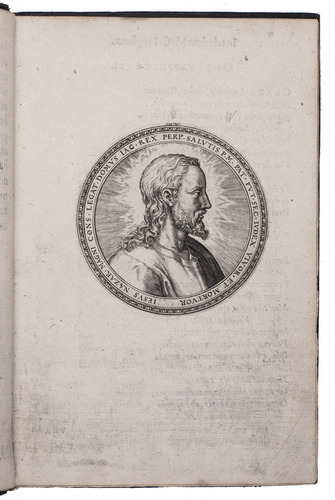 With an engraved, illustrated title-page bearing the initials of the engraver Pieter Huys and the date 1571, an unsigned circular portrait of Jesus in profile and 70 full-page engravings (16.5 x 11.5 cm) by several artists. 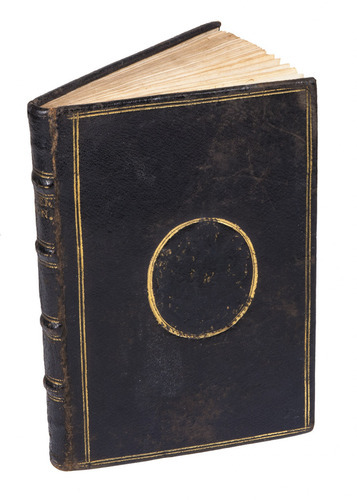 17th-century gold-tooled black goatskin, the front board with a centrepiece comprising coat-of-arms (with a name below it) in an oval (the arms and name mutilated, but probably Robert de Ligne or an heir), gilt edges, later endpapers. 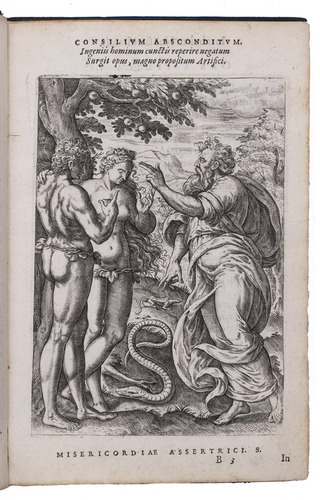 First quarto edition (with larger illustrations than the first two editions, which were in octavo format) of a collection of 70 beautiful full-page engraved illustrations from the Old and New Testaments, each accompanied by a Latin poem by Benito Arias Montanus (1527-1598), explaining the meaning and significance of the person or event represented. 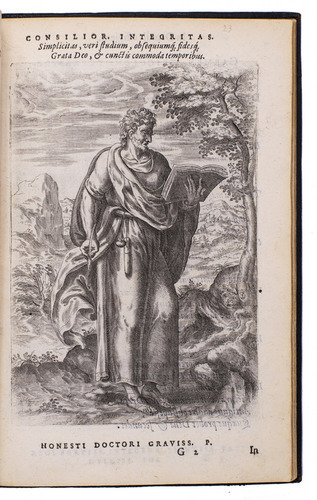 Arias Montanus, orientalist, Catholic exegete and editor of Plantin's famous Antwerp Polyglot Bible, led the life of an ascetic, dividing his time between prayer and study. 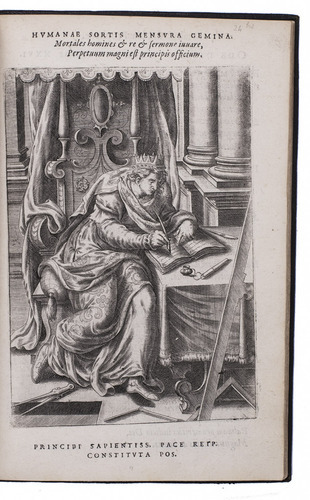 He was also celebrated as a poet, chiefly of religious verse. 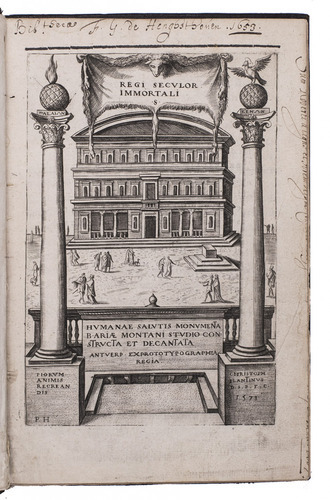 The present edition has the same main text, approbation, privilege and forewords by Plantin as the first two editions, and the plate for the engraved title-page, still dated "1571", was also used for the first edition (the second used a reduced copy). 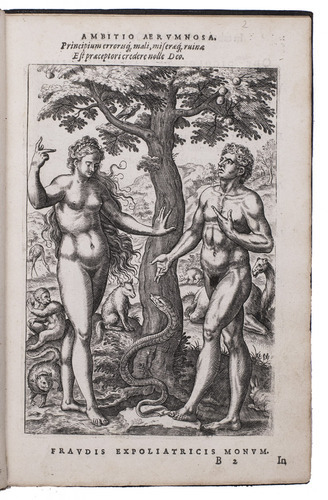 The illustrations, however, are much larger than in the octavo editions. 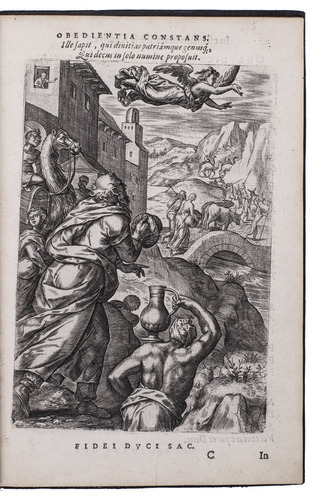 Many of them also appeared in the folio Bible of 1583 and some in earlier liturgical works, and Plantin no doubt commissioned them for those publications. 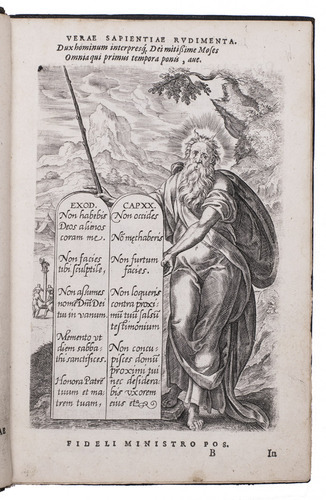 But he apparently recognized that this stock of beautiful copperplate engravings perfectly suited his friend Arias Montanus's poems, leading him to use them to produce a new edition in the larger quarto format. 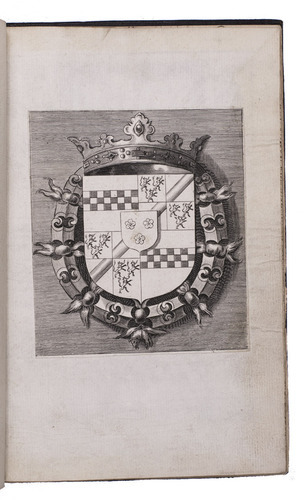 The present copy was first owned by a member of one of the leading families of the Southern Low Countries, Robert de Ligne (1564-1614), Baron (from 1613 Prince) of Barbançon and Arenberg, and Captain of the bodyguard of the Archduke and Archduchess Albert and Isabelle. One text leaf with a cut (fortunately between the lines of type), a fold and a couple early marginal repairs, a small rust hole in another text leaf and an occasional minor marginal defect, but still in good condition. 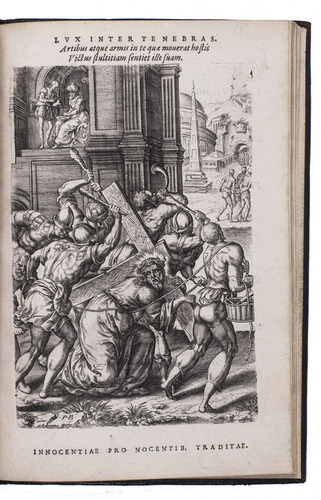 The arms on the binding are mutilated, and the binding further shows some wear and one headband is damaged, but it remains structurally sound. 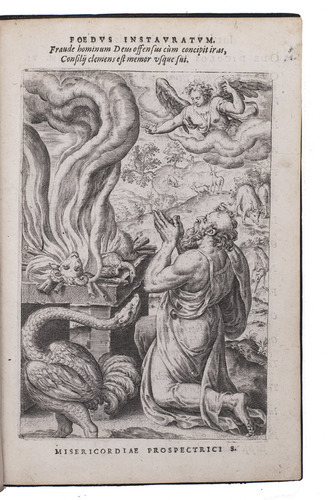 The most beautifully illustrated edition of Arias Montanus's poems written to elucidate bible scenes. 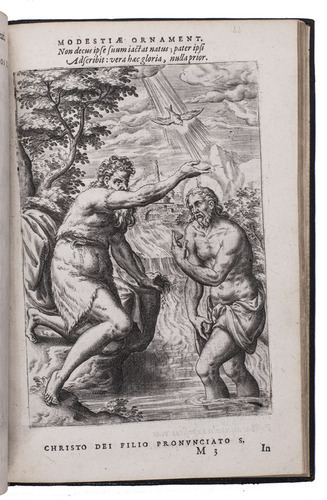 Morales 20; Netherlandish books 2479 & 2521? ; Ruelens & De Backer, p. 108; USTC 401970 & 411594? ; Voet 590.